You may have noticed the banner photo on the blog has changed. As I explained to reader Bill, the problem is Waiouru. The boat is simply too long and either the bow or stern has to be cut off the photo for it to fit. Then I had this great idea. What if I were to take the photo in a curved lock. There aren’t many of them on the network which is why it took so long, however as you can see we finally managed to pass through one and take that desired photo! We had the filters ordered over the internet delivered the other day. Replacing the air filter was easy, but replacing the fuel filter identified a small problem. Actually it’s the first time I’ve changed the fuel filter since we left Aldermaston in early 2013. The replacement timeframe doesn’t concern me as we have two inline pre-filters and the manual states a maximum of two years between changes. What did concern me was the fraying of the fuel line where the bottom of the old fuel filter had been rubbing (vibrating) against the rubber fuel hose. It wasn’t until I’d removed the filter that I noticed the smooth indentation/groove in the hose. What I have done as a protective measure has been to wrap several layers of pvc insulation tape over the indentation. 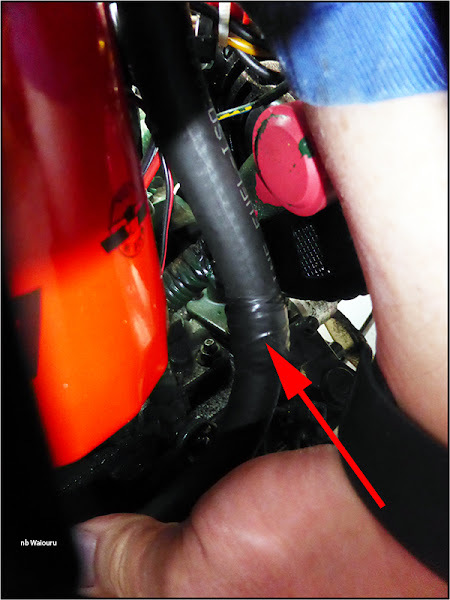 If any reader has a Beta 43 engine they might want to check their flexible fuel line where it passes under the filter. I’ll have to start looking for a new fuel hose plus some additional permanent protection to prevent a re-occurrence. We moved today. Not very far…. perhaps a kilometre! It was the closest location to the nearby huge Tesco Extra and Marks & Spencer. You can guess what we did in the afternoon. Thanks for the tip re the fuel line. The replacement filter Beta have sent me is slightly shorter than the original fitted to the engine so I wonder if they know this wear is occuring. Banana boat takes on a whole new meaning! At least there are no large spiders aboard!